Once you receive your Harmony Fine Arts plans, there are a few steps you need to take to get started. I always print my plans out on copier paper but you can work directly from an electronic device if you download and save the file instead. 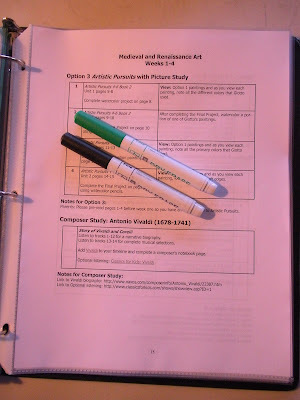 I thought it might be helpful to give a little photo tutorial on how I organize my Harmony Fine Arts materials so you will have an idea of where to start. Although the plans are not very long or complex, once you start using the plans you will understand how these very simple schedules can be used to provide a whole year of activities. 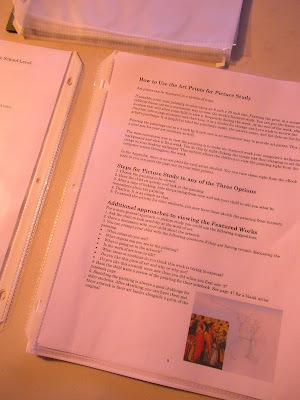 I take the plans and slip them into sheet protectors and then into a binder. This allows me to have them readily available for use each week as I plan and then guide my boys. Now that my boys are older, they can grab the binder and find their own assignments. After you read the introduction and the notes section, take a dry erase marker and go through the materials list and mark the books and CDs that you have already and those that you will need to order. Make sure to check your local library as well for any materials you can borrow and use instead of purchasing them. I have tried to schedule books that are widely used so there is a really good chance that your library will have some of the books used in the plans. 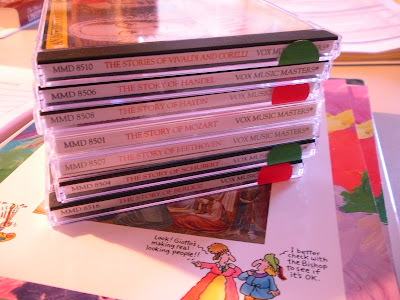 I always like to remind families that although I schedule specific CDs to listen to for each composer, you can be flexible and use any CD that you have on hand to save some money. The CDs in the plans are usually just suggestions to get you started. 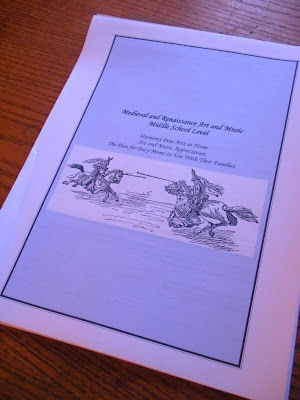 I have included links in the new ebook format to online listening in addition to the CDs. You also may have access to an online music service where you can search for the suggested musical selections for free. Be creative and save some money! Those are the introductory steps to help you organize your HFA plans. I hope this tutorial helps families in their preparation to use Harmony Fine Arts. If at any time you have questions, please feel free to email. 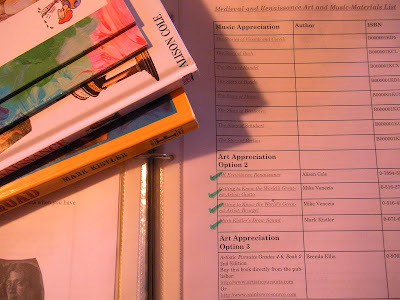 If you would like to see a sample week planned out for Harmony Fine Arts Grade One, you can pop over to this entry to see how I suggest you take a week and plan it out: Grade One Example Week. Heard of this for the first time tonight on the notebooking pages fb party. I am guilty of neglecting this area and it is the one I enjoy the most. How would I incorporate these tools with several ages? My girls are 13, 11,8,5,and 3. Heard of you tonight for the first time @ notebooking fb party. How would I incorporate these tools with different age groups? My girls are 13,11,8,5,and 3. Hi, I’m interested in the art plans that you offer. Would you let me know what your price is for the art plans? Thanks.